If I were to open by describing my setting as a desk piled high with old issues of The London Magazine, the wine red May 1960 issue face down on top, rust-brown rimmed teacup marking the narrow No Man’s Land between the pile and my laptop, you would assume I were telling the truth. If I were to add that the red reminded me of blood spilled last week in rage and the brown rimmed cup of the plughole down which that blood spiraled, you would assume I was either lying or mad. 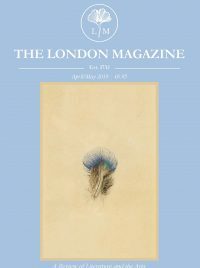 On Thursday at Burley Fisher Books in East London, The London Magazine will be collaborating on an evening of poetry and spoken word with the poetry publishers New River Press.